For 63 years, New York’s Museum of Arts and Design (MAD) has explored craft, art, and design with a particular emphasis on the skilled creative processes that transform materials. Now, with the appointment of John Underkoffler as Curator-at-Large for Design Technology, MAD is highlighting technology as an integral element of the 21st century cultural conversation and an object of artistic inquiry. Technology has always been at the core of art and design. En plein air painting, for example, favored by Impressionists such as Renoir, Monet, and Degas, was popularized in the 1840s by the (technological) development of paint in portable tubes. As technology influences aesthetics in ever-evolving ways, Underkoffler is a notable choice. Mezzanine, the flagship product from his company, Oblong Industries, offers a multi-modal interface including gesture that brings the fluid content system of the sci-fi touchstone Minority Report to the real world. Known as the g-speak Spatial Operating Environment, Underkoffler’s gestural interface is being incorporated into applications for aerospace, biometrics, and video editing, among others. Ingenuity is at the heart of MAD’s mission. Founded in 1956 as the Museum of Contemporary Crafts, the handcrafted arts were a tight focus during its formative years. As decades progressed, the Museum’s mandate expanded to include craft in dialogue with contemporary art, architecture, fashion, industrial design and even the performing arts, and technology in general. 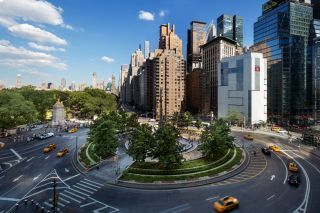 This evolution informed the decision to rename the institution in 2002, and the wider interests on display at 2 Columbus Circle, where the Museum has lived since 2008. In bringing John Underkoffler onboard, MAD is pursuing an interdisciplinary approach to arts and design. According to Scoates, Underkoffler’s multiple talents and passions mirror those of legendary artists such as Brian Eno, who has married music and technology to create entirely new genres. Because Underkoffler is not bound by curatorial conventions, “there's an opportunity for something new to happen in the galleries, with MAD pushing forward the needed conversation for how museums can continue to be vital contributors to contemporary culture,” Scoates added. MAD’s move to upend and extend conventional interpretations of “craft” is made evident in its upcoming exhibition, “Too Fast to Live, Too Young to Die: Punk Graphics, 1976-1986.” Running April 9 – August 18, 2019, the show leverages punk’s explosive visual language to examine its countercultural influence on society through design. The exhibition features punk’s startling juxtapositions of expropriated images and text, and the graphically ragged “do-it-yourself” zines and flyers that captured the anarchistic energy of the movement.